Winter sunshine illuminates the taonga that Samoan manuhiri are preparing to present to Taranaki people at Owae Marae, Waitara, 29 June 2013. Image: Fatu Tauafiafi, Samoan Observer/Pacific Guardians. In 2012, during a year living back home in New Zealand, I met Australian-born historian Patricia O’Brien. Patty was the Stout Research Centre fellow, the first Australian to hold this position. She was working on a biography of Samoan nationalist leader Ta’isi O. F. Nelson. I was an honorary fellow at the centre and went there one day a week. I shared an office with Rachel Barrowman. I worked on two projects. The first one was a scoping report for the Ministry of Heritage and Culture’s Treaty Settlements history project. This was an extremely difficult task and I often woke at 4am in a panic about it. My bedtime reading was early Tribunal judgments and Crown Forestry Rental Trust reports. One day I sat down to write and a numbness swept through my body. I could not move my fingers or my arms. I had the heater on full bore but I was frozen. The feeling lasted about half an hour until my mind re-imposed its will on my limbs and I could continue tapping away. I got the message though. No more Crown-funded settlement histories for me. I spent the rest of my time at the Stout researching Orimupiko 22, small block of (Taranaki) Māori land owned by my whānau. Patty had the big office across the hallway. At first I was suspicious of her. Like me, she is a palagi. Unlike me though, Patty does not have any Samoan relatives. What was her connection to Samoa? Why was she doing this project? But as I watched her, my feelings changed. I came to hold Patty in very high regard. I respected the way she was conducting herself and the relationships that she was creating and maintaining with the descendants of Ta’isi Nelson and the other men and women she was researching. I liked her emotional openness and empathy. I could see why chiefly Samoan people had chosen to work with her. These feelings of respect were enhanced when Patty’s research reached into my world – Taranaki – and revealed hitherto submerged set of relationships between the non-violent activism of Parihaka people in the nineteenth century and the non-violent kaupapa of the early twentieth century Samoan Mau. I enjoyed being able to share what knowledge I had about Parihaka with her. After the year was up, I returned to Australia and Patty went back to the United States. She and her husband both had academic jobs in Washington. In May 2013, Patty got in touch. The Samoan head of state, His Highness Tui Atua Tupua Tamasese Efi, would be in New Zealand for Pōmare Day 2013. Patty was coming over from the States. I should come too. Could I? I mention all this here because the reasons that a piece of writing comes into existence can be as important and interesting as the content of the writing itself. What follows is an edited version of a talk I gave in 2014 at Victoria University, Wellington. ‘Fast History, Slow Reading: He Pukapuka Tataku Tenei’ was a one-day symposium convened by Professor Charlotte Macdonald and Dr Arini Loader, the first Māori scholar to hold a postdoctoral fellowship in the history program. The title refers to South African scholar Isabel Hofmeyr’s brilliant 2013 book Gandhi’s Printing Press: Experiments in Slow Reading. I have done my best to reference sources in the text and included a formal list of references at the end. 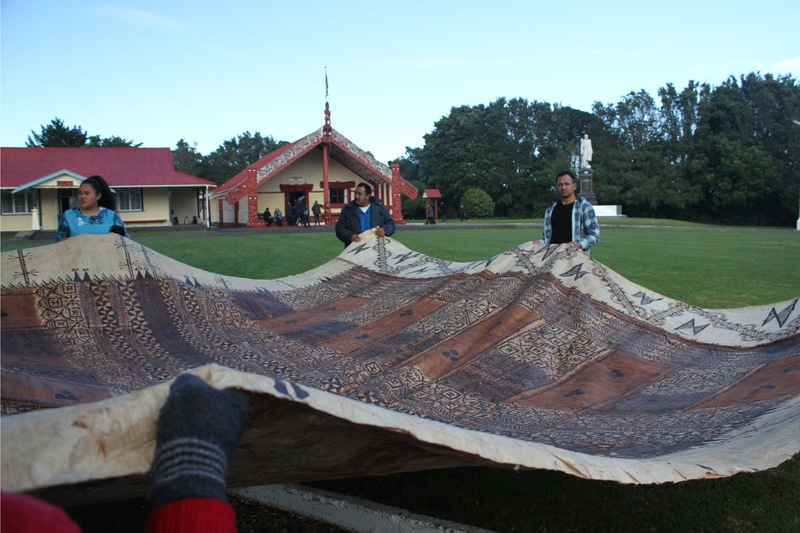 Unfurling the tapa, Owae Marae. The carved meeting house is Te Ika Roa-a-Maui and the statue of Māui Pōmare is to the far right. Image: Fatu Tauafiafi, Samoan Observer/Pacific Guardians. The snow covered Taranaki from head to toe and he shone a hard white against the pink sky. Māui Pōmare, a nine-foot effigy carved from Sicilian marble, was much the same. He shone too, cloaked, buttoned up and dapper, a scroll in his right hand and his opposite foot was slightly forward, an orator’s stance. From his great height he looked out at the assembled crowd with an attitude of calm watchfulness. The visitors were early. The black cars had come up the driveway. Flags flew on the front of one of them. The people got out. They were well dressed. One woman wore an elegant pink dress and she had a yellow flower pinned behind her ear. There was a man dressed all in white, a fitted shirt with gleaming buttons and a white jacket, an immaculate lavalava fringed with tapa beneath. Around his neck was a long necklace made from red shells. The outfit suggested clicked heels and ship’s horns, the heavy drop of an anchor but it also spoke of warmer things, of sand too pale for Taranaki beaches and the comfort of unexpected friendship. A figure caught his eye. This man was taller than the rest. He was simply dressed in a suit, black overcoat and scarf. Māui studied the man’s face, the quiet, dignified way he held himself. The features made his heart jump. The face of this visitor reflected two men who had mattered greatly to him. Here was his dear friend Ta’isi Nelson, come again to Waitara, but here also was Tupua Tamasese Lealofi, no longer imprisoned at Mt Eden. The call went out and Māui watched the visitors walk towards him. The tall man kept his head bowed. His Highness Tui Atua Tupua Tamasese Efi, mokopuna of non-violent nationalist leaders Ta’isi and Tamasese, head of state of the independent nation of Samoa, had arrived! 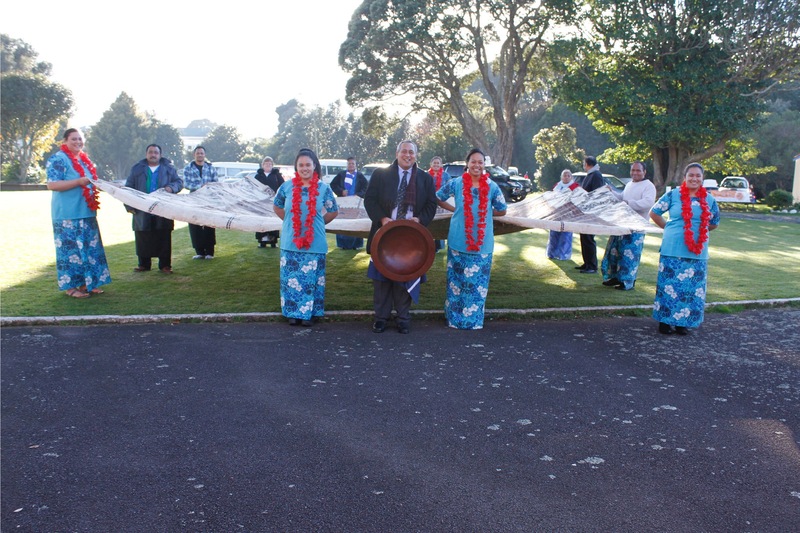 In 2012, members of Taranaki’s Samoan community had come to Pōmare Day, bringing a tapa, and the together the gathering had celebrated 50 years of Samoan independence. In a moving gesture of respect, the hosts had greeted the Samoan visitors as tuākana (older siblings). Another year had passed and this day, 29 June 2013, would reveal, renew and re-enact a hitherto submerged set of deep relationships between the Ta’isi and Pōmare families and between Taranaki and Samoa. 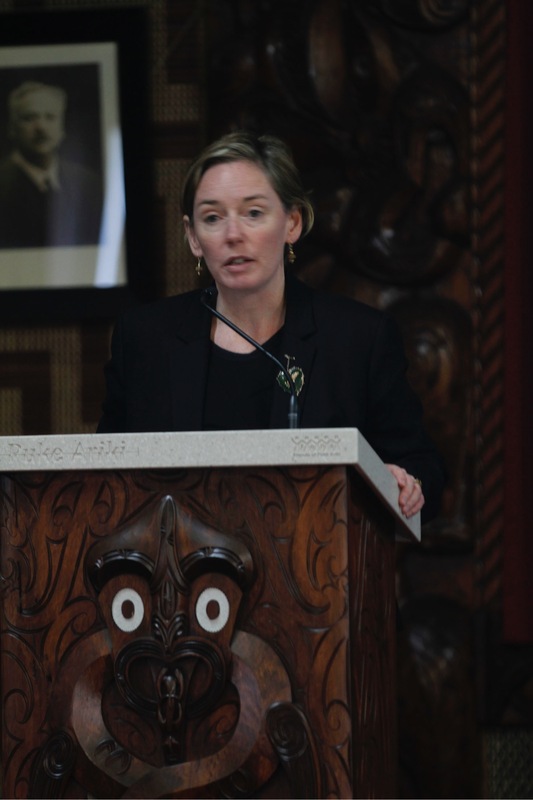 Patricia O’Brien’s scholarship had reactivated memories of the pan-Pacific statesmanship of Nelson and Pōmare and other leaders such as Apirana Ngata. ‘Ta’isi O.F. Nelson and Sir Māui Pōmare: Samoans and Māori Reunited’ is now the most read article on in the Journal of Pacific History so you can download it for free. The events that unfolded at Owae in 2013 were extensively covered in the Samoan Observer, an independent newspaper, and by the Pacific Guardians website. Fatu Tauafiafi’s photographs ran over four pages with the strap ‘We’re reminded: The Mau of Maui Pomare and Ta’isi’. The newspaper also published His Highness’s speech in full. The visit received no coverage in New Zealand. This talk redresses that unfortunate silence and honours a pledge I made to write about the day. In the spirit of Isabel Hofmeyr and her subject, the newspaper man Gandhi, my paper uses condensation, summary, extracts, abridgement and reporting to give a Taranaki perspective on the multiple strands of time and meaning in operation during Pōmare Day 2013, a commemoration that foregrounded the Pacific – a place but also an attitude or state of mind – as paramount. 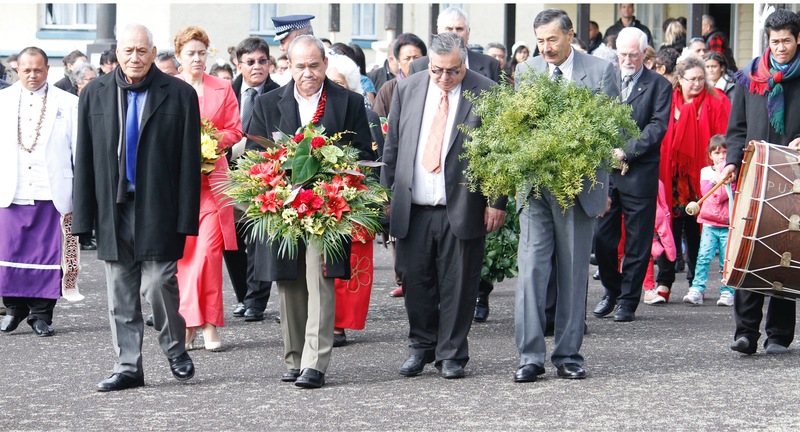 The Samoan head of state, His Highness Tui Atua Tupua Tamasese Efi and Samoa’s High Commissioner in New Zealand, Leasi Papali’i Tommy Scanlan, join members of Māui Pōmare’s whānau to lay wreaths. Note the Parihaka drum on the right. Photo: Fatu Tauafiafi/Pacific Guardians. The frost thawed. The damp seeped into the visitor’s shoes as they walked across the marae. The land spoke first. It said: this soil you walk on may seem unremarkable but here, in my bones, are remnants of great might. It said: Owae may look modest now but it was once most magnificent and fierce, a small portion of the great pre-European pā Manukorihi. In 1841, no stranger could enter here with ease. The place was a warren of concealed weapons and warriors. The earthworks were extensive, the defenses immensely strong. No taua ever took this place. Pukerangiora was another pā just up the river. In 1831, Waikato musket raiders massacred up to 1500 Te Ati Awa people there. Many decided to jump over the white cliffs to their deaths, rather than be captured and enslaved. Less than 30 years on, the enemy was not another iwi but British soldiers and settlers, the hunt for land. This remnant, Owae, overlooks PekaPeka, the block of land that Te Teira sold to the British in 1859, against the wishes of his relatives, including Te Ati Awa rangatira Wiremu Kingi Te Rangitake. He refused to sell anything. He fought back. Te Ati Awa refused to surrender or negotiate and on 17 March 1860, British soldiers fired guns and rockets at the locals. So began the Taranaki war. In 1863, the British government confiscated 1.275 million hectares of land in punishment for “the rebellion”. Even the mountain was taken. From 1860 until 1927, when the Royal Commission into Confiscated Lands sat here, no European had been allowed on Manukorihi. Walk gently here. Listen. Pō mare, a cough in the darkness. 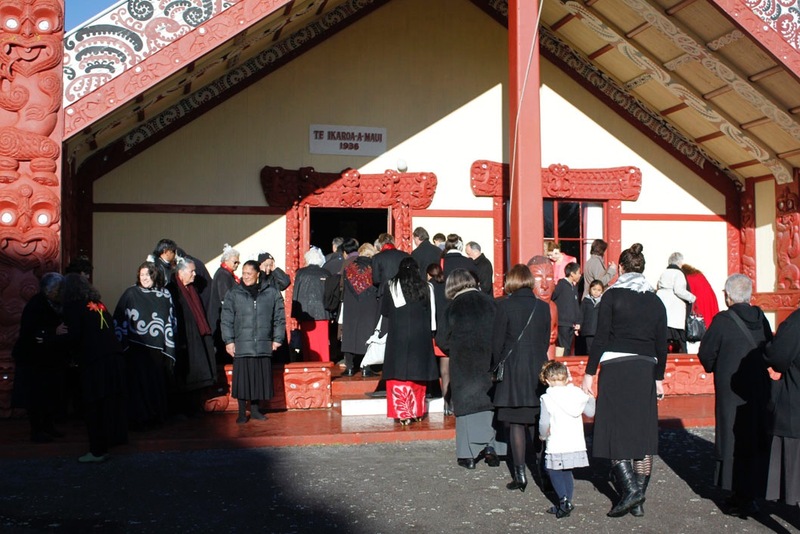 Honiana Love and other Taranaki kuia call visitors into the house. Photo: Fatu Fauafiafi/Pacific Guardians. Pōmare was born in the middle of the war, in 1876 at Urenui in north Taranaki, and died in 1930 in Los Angeles, stricken with tuberculosis. He was cremated and his ashes came back to Waitara via Rarotonga (Pōmare had been Minister for the Cook Islands from 1916 – 1928), Wellington and Waikanae. Large memorial services were held in each place and the casket lay in state inside the vestibule of Parliament buildings, quite an achievement for a man who had begun life in a community that the New Zealand government declared to be seditious rebels. The friendship between Pōmare and Nelson was nourished by the political philosophy and spiritual beliefs of Māui’s childhood. Pōmare’s parents believed in Parihaka and its prophets and clung to Te Whiti’s promises that non-violent protest would compel the government to return the confiscated land. Pōmare and his parents were at Parihaka in November 1881 when the place was invaded. Māui was only five, one of the hundreds of dancing and singing children on the front line, his gaze level with a spurred boot in a stirrup or a bayonet in a sheath. He watched their home being wrecked and their treasures being stolen. He saw his leaders being arrested and the soldiers killing their animals and pulling up their crops. People got sick. Both the prophets Te Whiti and Tohu were asthmatic. The Taranaki damp got into people’s lungs and clogged them up. Skin flamed with psoriasis and other infections. Was Pōmare’s life’s work as a healer set in his infancy? Educated at Te Aute College, Pōmare went against his family’s wishes for him to study law and did medicine instead. He trained as a medical doctor at Battle Creek, Michigan and qualified in 1899. He came home and in 1901 was appointed Māori health officer. Diagnoses, prescription, cure. The white coat of Western medicine appeared to be a way out for Taranaki and we produced two outstanding takuta tangata, Pōmare and his younger relative Te Rangihiroa Peter Buck. Both men were radical modernisers. Pōmare was outspoken in his criticisms of the teachings of Parihaka and its philosophies of withdrawal from the Pakeha world. In one of his first reports as a Māori health officer, Pōmare said Te Whiti-ism and prejudice against Pakeha were holding Taranaki Māori back. When Te Whiti died in 1907, a shameless Pōmare took the chance to reinforce the message. In his tangi oration, Pōmare said Taranaki people needed new skills and tactics. Reworking the well-known whakatauki he said: “The old order has changed; your ancestors said it would change. When the net is old and worn it is cast aside and the new net goes fishing.” Both Pōmare and Buck were enthusiastic supporters of James Carroll’s controversial Tohunga Suppression Act, also passed in 1907. In 1909, Pōmare and Robert Tahupotiki Haddon, a Methodist clergyman, set up a union to push for some confiscated West Coast reserve land to be made available for Māori. As Ben White wrote in a 1996 report for the Waitangi Tribunal’s Taranaki inquiry, the leaders wanted to encourage young people to leave the ailing Parihaka and start farming instead. If Taranaki people wanted to survive “we must become active farmers, not mere rent receivers”, Pōmare said. Sunlight blesses the tapa that has just entered the house. Fatu Tauafiafi’s image captures the sacred reverence and awe of this moment. The Royal Commission condemned the Taranaki confiscations and in 1931, the year after Pōmare’s death, Taranaki people settled with the Crown. The Taranaki Māori Trust Board was set up and it would be paid 5000 pounds a year, in recognition “of the wrong that was done”. On 28 June 1935, Taranaki leaders decided to build a carved house in honour of Pōmare and to commission a large statue too. They asked Apirana Ngata to organise the project and supervise construction. Fourteen carvers from Rotorua, the East Coast, Patea, Otaki, Hokianga, Ohau, Kaikohe and Rarotonga worked on the house. Twenty-three women stitched the tukutuku panels that recall Taranaki cosmogony, the figures of Kahui-Ao the son of Ranginui and Papa and all the people that followed. Many of these artists were members of the Ngati Poneke Club in Wellington. The carvers and weavers finished their monumental task in just a year! More than 10,000 people attended the unveiling, on 27 June 1936, including the Governor General, the Māori King and Premier Joseph Savage. On 29 June 2013, this is the whare whakairo that greeted the Samoan head of state. When His Highness and the other visitors entered the whare, they walked beneath the Maui-tikitiki-a Taranaga, the mischievous figure on the tekoteko, but they also walked beneath the Taranaki Māui. Hui whakamahara ki a Maui Pomare, Manukorihi Pa, Waitara, Hune 23-27th 1936, a 94-page souvenir booklet was produced to commemorate the 1936 opening of the house. The bilingual booklet documents every figure in the house, including the figures on the tekoteko. It explains: Below [Maui-Tikitiki-a-Taranga] him to support this herculean effort is the tiki or koruru which has been named Māui Pomare, who fished out of the troublous ocean of racial conflict and misunderstanding the fish, which is the Taranaki Māori Trust Fund, the tardy requital in 1936, of the Waitara injustice of 1859.” At night, the booklet said, Pōmare’s eyes were lit up by ‘two large electric orbs’ that “gaze over the storied marae of Manukorihi towards the White Cliffs”. In 2013, a different kind of herculean effort would be recalled, one that honoured relationships that began before the epic migrations to Aotearoa, to the time when Māori people were Pacific Islanders, living in the Polynesian homeland that is spoken about at tangi, Hawaikinui. As Alice Te Punga Somerville has so brilliantly, observed, Māori once were Pacific, a phrase that conjures up genetic and geographic kinship but also “pacific in the original sense of being calm”, to be peaceable rather than warlike, to be at peace. 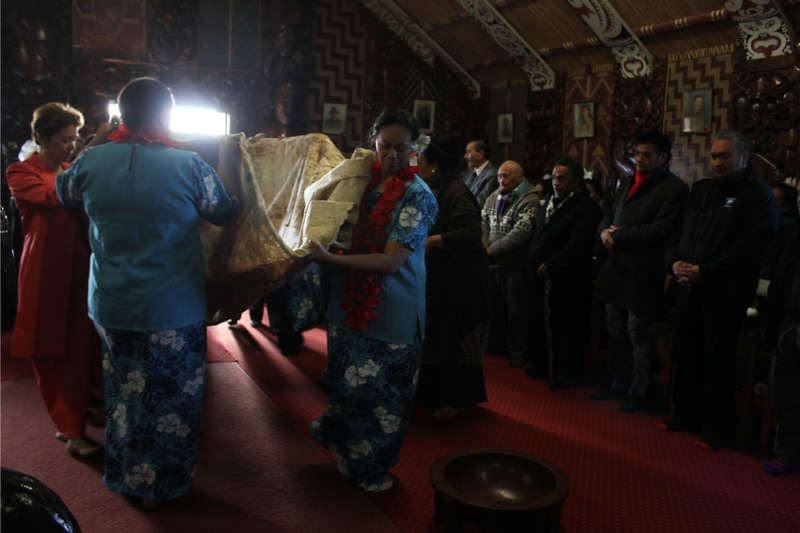 On 29 June 2013, Uenuku, Turi and Manaia watched the greetings being exchanged. As the powhiri got underway, the visitor in the white shirt and jacket, seated a few rows behind His Highness towards the side of the house, began to undress. He took off his jacket, then his shirt. Fine tattoos wrapped around the side of his torso. An older woman rubbed oil into the man’s skin. The man picked up an object with a thick woven handle and a tassled top and he hung the tassled end over his shoulder. When the right moment arrived, he stood up and started to call out in strong, deep voice. This was the orator. The door of Te Ikaroa-a-Māui was open. The morning was fine and clear and a square of golden light fell into the room. The man’s voice filled the space. Outside, a gift had been unfurled. A dozen people held the tapa cloth open to the sun. The orator began to chant. His drone filled the house. The kakaho reeds that line the roof shook. Māui’s eyes rolled back in his head. Visitors’ skin prickled. People wept. In the centre of the house sat members of Taranaki’s Samoan community and these women and men began to sing, beneath the orator’s dirge, and then the tapa entered the house and it was an immense, delicate, decorated, sacred body lying there, vibrating somehow, speaking somehow, waiting and the singing became louder and the tone shifted from sombre to joyful but the moment was still unbearably heavy, as if every second was swollen with some sort of monumental depth and meaning. 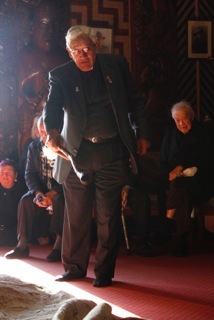 Ruakere Hond blessed the tapa and Tiki Raumati addressed it and the dignataries. The atmosphere lightened a little. The proceedings continued. 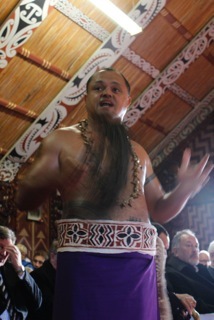 The orator for His Highness Tupua performs inside Te Ika Roa-a-Maui. Morrie Love, director of the Waitangi Tribunal from 1996-2003, is to the right. Photo: Fatu Tauafiafi/Pacific Guardians. “I come on a pilgrimage to share with you a legacy of remembrance,” His Highness would explain later that morning, in his beautiful speech. “My grandfather always said to me: ‘Son, you will remember the people who gave us succour in our hour of need’.” He cited a Samoan proverb: He who rallies in my hour of need is my bone, my blood and my flesh. A memorial was more than ritual, he said. It was a time of holiness and meditation. And then he too began to chant, “for in our Polynesion cultures, there are moments when our thoughts, as the poets would have it, while too deep for tears find strength in song”. Historian Dr Patricia O’Brien speaks to the house. You can see a photograph of Sir Māui Pōmare over her left shoulder. Photo: Fatu Tauafiafi/Pacific Guardians. Dr Patricia O’Brien spoke next. Patty had received a fellowship to work on New Zealand’s colonial history with Samoa and her research had unearthed Pōmare’s tenacious advocacy for Samoan independence, an advocacy that often put him at odds with his own Prime Minister (Gordon Coates) and his fellow National MPs. Patty explained how Pōmare’s engagement with Samoa grew through his intimate friendship with nationalist leader Tai’isi Olaf Frederick Nelson. The pair had met in 1919, five years after New Zealand occupied German Samoa and one year after the New Zealand government allowed the ship Tulane, which carried passengers with influenza, to dock in Apia. The flu spread ashore and 8500 people died, more than a fifth of Samoa’s people died in this preventable catastrophe. Samoans had formed the Mau a Pule in 1908 to protest German colonial rule and the Mau was reformed in 1926 in protest New Zealand’s administration, especially new laws which denigrated chiefly status. Mau men and women disrupted the NZ administration via non-violent marches, boycotting businesses, refusal to pay taxes and other kinds of civil disobedience and they shared information about other Mau independence movements (in India, Iraq, Palestine, China, the Dutch East Indies, Ireland and more) via their own newspaper, Samoan Guardian. In 1928, the movement’s leader, Tai’isi was banished to New Zealand and he lived there for the next five years, staying, often with Pōmare in either Waitara or Upper Hutt. Patricia said she had learned about the Nelson-Pōmare friendship by reading a collection of Nelson’s letters held at Ta’isi’s Apia mansion. In one letter, written in 1929, Tai’isi describes exiled Mau leader Tamasese Lealofi, who was then imprisoned in Auckland, as the “Te Whiti of Samoa”. This phrase was a lightning bolt that illuminated new Pacific forefathers for the non-violent Mau. Here was evidence that the Mau’s non-violent tactics were not only derived from Gandhi – as was widely assumed – but also from Tohu and Te Whiti at Parihaka. Pōmare had ostensibly been so dismissive of Parihaka and its leaders and yet he had thrown the “old net” of passive resistance out to his “Polynesian kinsmen” and gathered them into the school of non-violence, a strategic response to the failure of armed resistance. Pōmare died less than seven months later in Los Angeles, where he had gone to seek a cure. Patricia read out part of the English translation of Ta’isi’s impassioned obituary, published in the Samoan Guardian: “The moon has fallen in the Council of Chiefs and Kings of Aotearoa. POMARE IS DEAD.” The loss was great for him as a man and for Samoa as a nation. Like His Highness, Patty’s voice cracked with emotion as she concluded her talk. Pōmare Day had moved into unimaginable new realms of intensity when suddenly a figure emerged from a side door, a tall young woman bedecked in a dazzling outfit of blue and silver. Her dark hair was crowned by a towering Cleopatra-style head-piece worthy of pop singer Katy Perry. This gorgeous personage laid a tray of ornamental delicacies at the feet of the now seated Samoan head of state and then she began to dance. Raucous singing burst forth from each side of the stage. Laughter followed and then the hākari and a nice cup of tea and the long trip home. The Venerable Tikituterangi Raumati, kaumatua of St Mary’s Cathedral New Plymouth, addresses the tapa. Photo: Fatu Tauafiafi/Pacific Guardians. The craft of journalism and the craft of history are both devoted to answering this question. The journalist is often an eyewitness to historic events, such as Pōmare Day 2013. The journalist describes the scene, interviews the participants and writes the story. This activity might be described as a fast reading. The historian is always late. The historian misses the action by years, decades, centuries or even epochs and attempts to catch up by hunting out the remaining primary source evidence, reading it against whatever else is available and writing the story. This might be described as slow reading. A fast reading could be described as shallow and reactive and slow reading as deep, comprehensive and considered but in Gandhi’s Printing Press, Isabel Hofmeyr suggests something quite different. Hofmeyr’s subject is Gandhi in South Africa (1893 – 1914) and the newspapers and pamphlets he produced at the International Printing Press. Hofmeyr reads Gandhi’s newspapers as objects (rather than as mere containers that can be mined for historical information). She examines how Gandhi selected and arranged copy in the multilingual Indian Opinion to create a newspaper in which news “seems more like a stream of opinion, idea and belief, culled from other papers, than a portfolio of occurrence”. In this way, Gandhi implicitly challenged the definition of an event as something discrete, simple and open to a crafted explanation (whether journalistic or scholarly). Instead, his newspaper, Indian Opinion, dissolved events into “a kaleidoscope of cuttings”. Gandhi’s “slow-motion” newspaper often published undated and unattributed snippets from newspapers across India and the wider British Empire. His purpose, Hofmeyr suggests, was partly to confound and disorient the reader and so slow down the tempo of an “industrialized information order” created by the telegraph, the train and the steamship. Gandhi felt speed-reading “macadamized” the mind. Macadam was stone used to smooth the surface of a road of footpath (named after McAdam, the Scottish man who invented the process). He published newspapers where every column was rigged with a judder bar. He used condensation, summary, abridgement, extracts and the seemingly random juxtaposition of undated, unattributed news cuttings with the writings of his favourite philosophers to create what Hofmeyr calls “multiple senses of time. The reader both feels himself or herself to be in the midst of these incidents as they are occurring” and so the reports acted as “a time capsule, releasing its presentness wherever it is published”. In his chapter in the award-winning book, Parihaka: The Art of Passive Resistance, Te Miringa Hohaia uses exactly this strategy. He has placed snippets of Parihaka oratory and waiata, recorded in by nineteenth century scribe Te Kaahui Kararehe, side by side. Some are dated but many are not. Waiata, oratory and proverbial sayings are presented and translated in a random order, separated by brief, enigmatic summary statements. It is impossible to read this collection quickly. Instead, the reader must stop and think about what is suggested not just by the taonga that have been shared but by the way they have been placed on the page. Like Gandhi, Te Miringa was an editor who selected and placed texts to create multiple senses of time and to allow space for a reader to make their own connections. It’s such hard work! This talk is an attempt to follow the lead of these two demanding editors. 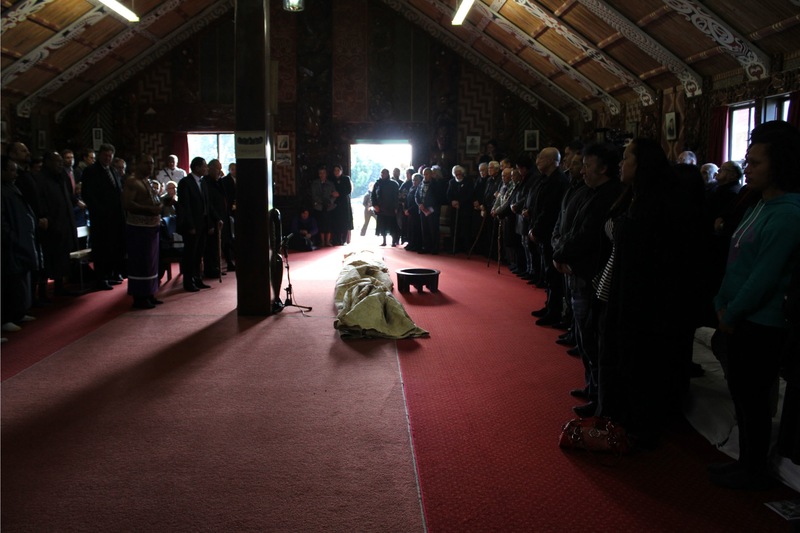 It juxtaposes a detailed account of one newsworthy event – Pōmare Day 2013 – with selected items that may contribute to an understanding of this event: the history of the marae; the history of the meeting house; selected biographical snippets and so on. It asks you, the listener, to consider how the life of Māui Pōmare might be reframed as an exercise in being a Pacific person, in the double way that Alice Te Punga Somerville suggests. He was someone who was of the Pacific and whose allegiances were to the Pacific and her peoples but he was also Pacific in nature, someone who was peaceable not warlike, someone who tended to make peace and someone who was, ultimately, at peace with himself. The Royal Commission into Confiscated Lands was not Pōmare’s last achievement or, necessarily his greatest one. That title, perhaps, goes to his support of Samoa and Samoans. In his speech on Pōmare Day 2013, His Highness recalled: “I remember as a boy of about five years learning to recite a text from St Mathew in honour of Sir Maui for Children’s White Sunday: “I was naked and you clothed me, I was sick and you visited me, I was in prison and you came to me.” The inspiration for this verse, in part, was the exquisite account Sir Maui gave of his visit to exiled leader Tamasese in Mt Eden jail. The symmetry is startling. The five-year-old Māui was brutalised at Parihaka but he was neither embittered nor vengeful. Māori never achieved the independence that Parihaka fought for yet Pōmare’s life is a study in self-rule and self determination, a patient negotiation between the new net and the old, a lesson in courageous non-violent resistance. Although Pōmare was an MP in a government that wanted to crush Samoan independence, he also acted as a statesman also for an older, deeper power, the Pacific empire, and it was this relationship that resonated, most powerfully, on Pōmare Day 2013. A precious remnant of the Pacific Empire. A memorial is more than a ritual. It is a time of holiness and meditation. Photo: Fatu Tauafiafi/Pacific Guardians. -Rachel Buchanan, The Parihaka Album: Lest We Forget (Huia, 2009). —Kelvin Day, editor, Contested Ground Te Whenua i Tohea: The Taranaki Wars 1860-1881, (Huia, 2010). –Isabel Hofmeyr, Gandhi’s Printing Press: Experiments in Slow Reading (Harvard University Press, 2013). Te Miringa Hohaia, Gregory O’Brien and Lara Strongman, editors, Parihaka: the art of passive resistance (Victoria University Press, 2001). —Hui whakamahara ki a Maui Pomare, Manukorihi Pa, Waitara, Hune 23-27th, 1936. McLeod & Slade, Printers, New Plymouth [N.Z. ], 1936, collection of the National Library of Australia. –Patricia O’Brien (2014), ‘Ta’isi O.F. Nelson and Sir Māui Pōmare Samoans and Māori Reunited’, Journal of Pacific History, 49:1, 26-49. –Alice Te Punga Somerville, Once Were Pacific: Māori Connections to Oceania (University of Minnesota Press, 2012). —Fatu Tauafiafi, photographs of Pōmare Day 2013, Samoan Observer. Images reproduced here with permission. With heartfelt thanks to Fatu for his wonderful images. –Ben White, Supplementary Report on the West Coast Settlement Reserves’, a report commissioned by the Waitangi Tribunal for the Taranaki claim, February 1996, collection of the Waitangi Tribunal Archive, Wellington. This entry was posted in Uncategorized and tagged Alice Te Punga Somerville, Apirana Ngata, Black Saturday massacre, Fatu Tauafiafi, Gandhi, His Highness Tui Atua Tupua Tamasese Efi, Isabel Hofmeyr, land confiscation, Maori history, Maui Pomare, New Zealand history, non-violent resistance, Owae Marae, Pacific history, Parihaka, Patricia O'Brien, Peter Buck Te Rangihiroa, Samoa, Samoan history, Samoan Mau, Stout Research Centre, Ta'isi Nelson, Taranaki, Te Whiti, Tiki Raumati, Tohu, Tupua Tamasese, Waitangi Tribunal. Bookmark the permalink.